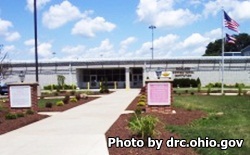 Richland Correctional Institution is located in Mansfield Ohio. It is a medium security prison that houses minimum and medium security male offenders. The capacity of Richland Correctional Institution is 2,924 inmates. The demographics of this facility are split with approximately half of the population being Caucasian and the other half being African American. Several years ago this facility saw quite a bit of violence due to an increase in gang related activity, this has since been drastically reduced. Today it Richland is considered one of the safer prison in Ohio. Richland Correctional Institution offers a wide range of re-entry and educational programing that helps inmates have a better chance of successful reintegration. Additionally, inmates who have a diploma or GED can take college courses. Vocational training in automotive repair, woodworking, barbering, drywall, HVAC, turf management, and graphic design are also available. All visitors must call 419-526-2199 ext. 0 and schedule an appointment in order to visit. Visiting hours are in two sessions from 7:45am-10:30am and from 12pm-2:45pm on Tuesdays, Wednesdays, Thursdays, Fridays, and Saturdays.